I recently completed a lovely residential project; a two-bed Georgian apartment in Bath city centre. I shared the details of the project in a feature for The Bath Magazine’s October 2018 issue. Here I share a slightly condensed version of that article. 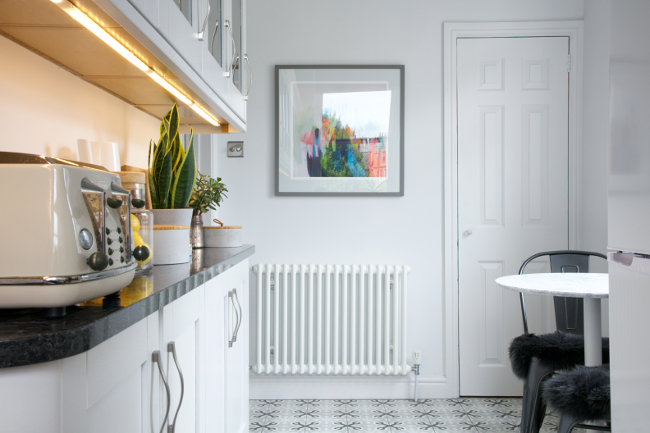 The client was a professional couple who had bought a two bedroom flat in Bath. 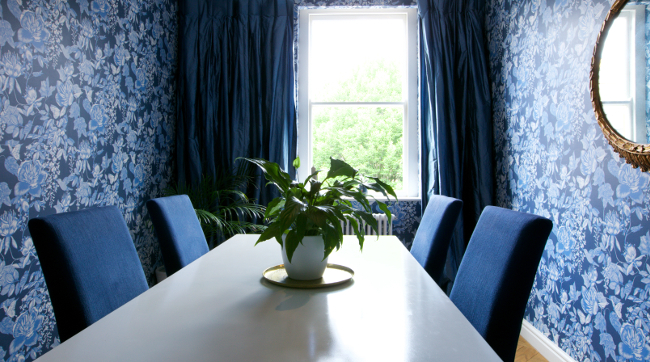 The brief was to provide a full design service for the flat’s interior refurbishment and furnishing. The couple didn’t have the time or local knowledge to manage the changes themselves, but had a strong sense of personal style, so it was to be a collaborative effort. The project involved recommending local tradesmen and coordinating the work. I sourced all flooring, tiles, sanitary ware, lighting and fabrics to complement the owners’ existing pieces. Working with the apartment’s existing character features, the idea was to create a vibrant, modern city home. The project began with an issue of Anthropologie magazine. A couple of images from the magazine had really captured the attention of my client, and so inspiration was drawn from these for the living room and guest bedroom. The owners had also selected several wallpapers they liked, and I helped narrow them down to two from Cole & Son. These wallpapers were the starting point for the dining room and master bedroom. The dining room wallpaper in shades of dark and light blue with off-white is bold and dramatic. It’s contrasted against the room’s contemporary white dining table. Raw silk cobalt blue curtains pool onto the parquet herringbone wooden floor and give the room a touch of theatricality. 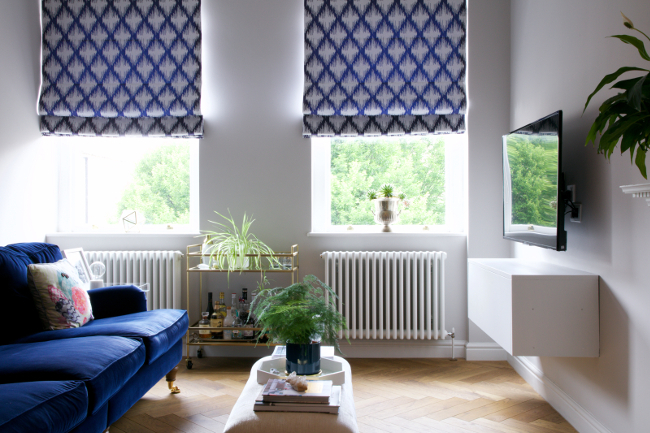 In the living room, the blue colour palette continues with ikat patterned blue blinds and a deep blue velvet sofa. In this room the beautiful parquet flooring really shines. 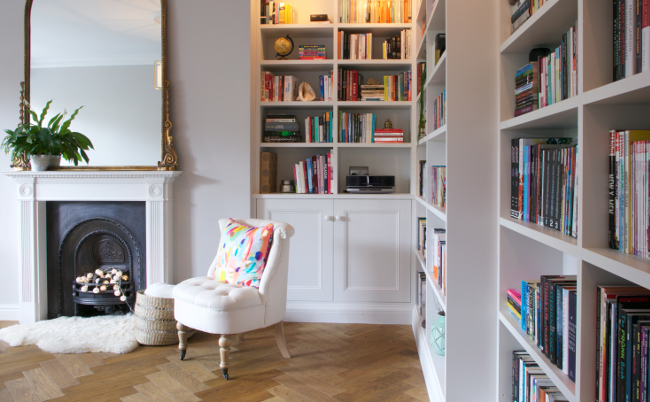 Piles of books fill custom-built shelving in one corner and the space is liberally decorated with the client’s own plants. The walls and existing cabinets of the galley shaped kitchen were painted in two shades of pale grey. Decorative ceramic floor tiles were laid; the bright print of the tiles providing some liveliness in the serene space. The master bedroom is a generously sized room with lots of natural light and an original fireplace. 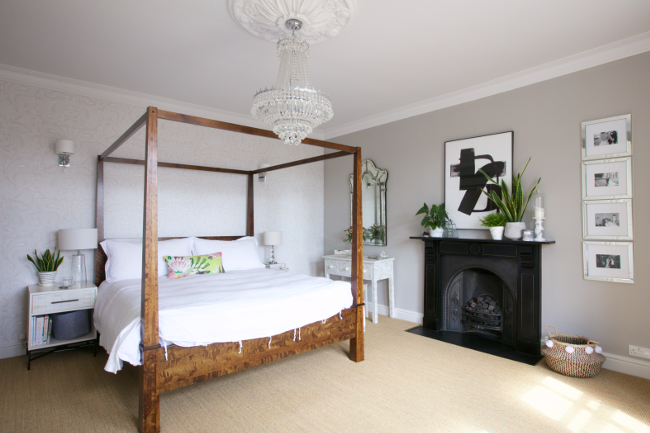 In this room Clair used the second Cole & Son wallpaper on one wall and complimented this with raw silk curtains in oyster, an eclectic mix of furniture and a contemporary wooden framed bed. 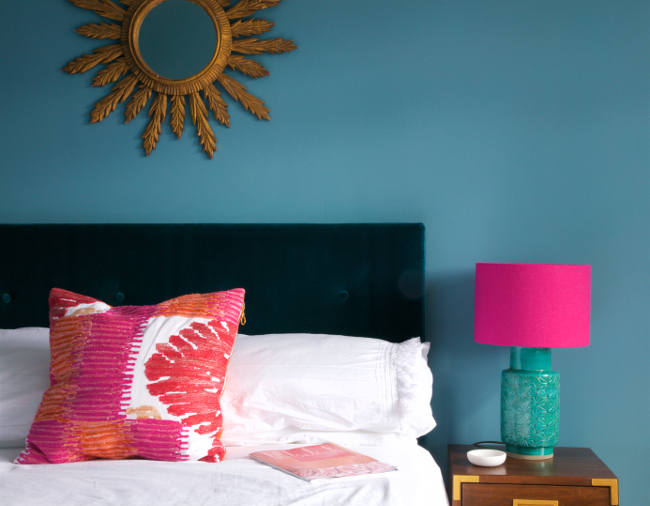 The guest room is painted in Farrow and Ball’s striking Stone Blue. The client chose artwork, cushions and flowers in pinks, greens and blues that deliberately clash in a vibrant and uplifting celebration of colour. 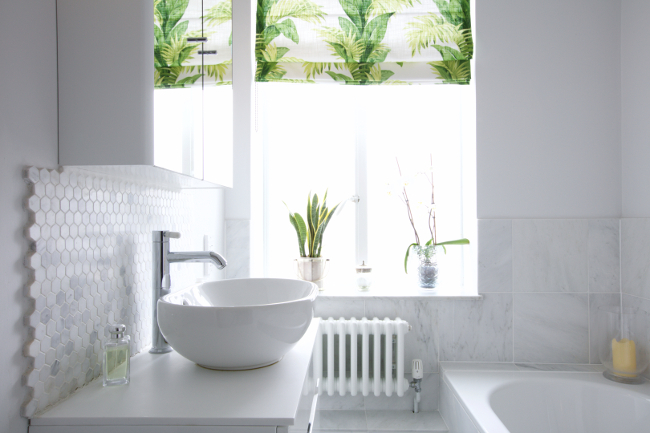 Finally, the bathroom: a classic and crisp space with Carrara marble tiles, pale grey painted walls and botanical green and white blinds. In here it’s the little details – such as marble handles on the basin and bath taps and the carefully placed succulents and candles in recessed alcoves – that add a touch of opulence.